GREAT SUNGLASSES DISPLAY AND STORAGE CASE - The perfect way to travel and display your sunglasses, eyeglasses, or glasses. 3 COMPARTMENT ORGANIZER FOR GLASSES - Includes 3 sunglasses and glasses suede pouches for additional scratch proof protection. DURABILITY AND PROTECTION - Shock proof and water resistant glasses travel case. 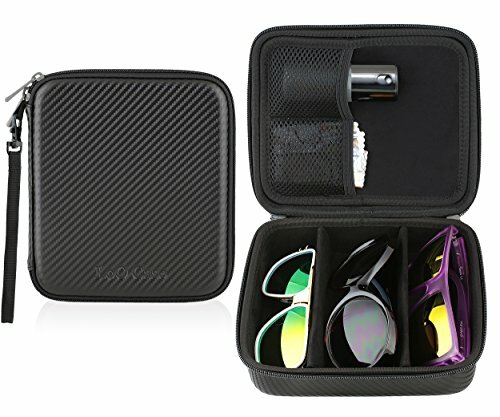 STYLISH AND PORTABLE SUNGLASSES AND EYEGLASSES TRAVEL CASE - Classic design with 2 internal mesh pouches for additional accessories. HIGH QUALITY SUEDE, PU LEATHER AND CARBON FIBER - Moisture proof Carbon Fiber exterior and soft real suede lining interior. If you have any questions about this product by TYD LoO Case, contact us by completing and submitting the form below. If you are looking for a specif part number, please include it with your message.